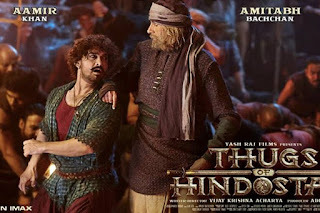 Thugs of Hindostan Box Office: Amitabh Bachchan and Aamir Khan starrer ‘Thugs of Hindosta’, released on Diwali, managed to collect Rs 28 crore on the second day. New Delhi: Amitabh Bachchan and Aamir Khan starrer ‘Thugs of Hindostan’, which was released on Diwali, got the biggest opening ever so far. With the release of ‘Thugs of Hindostan’, the box office earned boggling Rs 52 crore Bout However, the second day the film could earn a little over half. The film’s earnings have seen a huge drop of around 50%. Bad critics and audiences reviews have had an impact on the film’s collection. According to Box Office India data, ‘Thugs of Hindostan’ has managed to collect Rs 28 crore on the second day. The speed at which the box office is running, it can be estimated that the film will cross the figure of 100 crores in three days. The film has done business worth 78 crores on Thursday and Friday. It is expected that on Saturday and Sunday, there will be an increase in the collection of the film. Thugs of Hindostan is estimated to be made on a budget of Rs 300 Crores all inclusive of prints and advertising cost and is the most expensive movie ever made in the history of bollywood.